Be sure to share and tag photos with #globalgorlok! 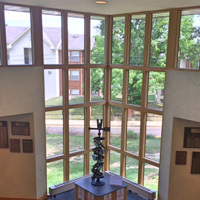 The Office of Study Abroad introduced a new art piece in the University Center on Aug. 8. Located on the landing between floors, this one of a kind mileage sign features the locations of Webster University’s international campuses and partners. It is designed to inspire students to study abroad and promote our international opportunities. Students and anyone interested in study abroad are encouraged to sign their name on the "shoe" featuring their favorite location. The site farthest away is Cha-Am, Thailand, and the closest to St. Louis is Oxford, U.K. This is a designated "selfie spot" so Webster community members are encouraged to take photos with this fun and “interactive” art piece. Be sure to tag these photos on social media with #globalgorlok. In addition to the many students who signed the "shoes" of their study abroad experience, several Webster faculty and staff also joined in the fun. The mileage sign, conceived by Webster alumna and Study Abroad representative Johany Glen, will be on display during the 2016-17 academic year in the University Center.